AUGUSTA, Ga. -- With 54 holes in the books and 18 more to get in before inclement weather hits on Sunday afternoon, the 2019 Masters is off and running early as play began at 7:30 a.m. ET. The televised broadcast window begins at 9 a.m. with the 54-hole leader and his group taking the course shortly thereafter. This will be golf at a breakneck pace at one of the most pristine courses and most revered tournaments of the year. 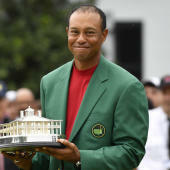 That means Tiger Woods, making his first appearance in a final pairing at Augusta National since 2007 after shooting a 7-under 67 on Saturday, will lineup alongside Tony Finau and solo leader Francesco Molinari at 9:20 a.m. Molinari is on top of the pack at 13 under, while Woods and Finau (who shot one of three 8-under 64s on Saturday) are two back at 11 under. There's plenty of big names behind them also in contention for a green jacket, and Sunday will be a sprint to the finish among some of the top golfers in the world. There will be plenty of action throughout the day at Augusta National, but with golfers playing in threesomes and starting at both the No. 1 and No. 10 tees, there's a lot to wade through. All that's left is to find out when Woods and your favorite golfers are playing so you can follow them throughout the day, both on CBS Sports and streaming on Masters Live. Well, we are here to answer that question for you. Here's a look at the tee times and pairings for Sunday as the 2019 Masters continues from Augusta National. Also, here's our complete TV coverage and live streaming guide for the Masters.